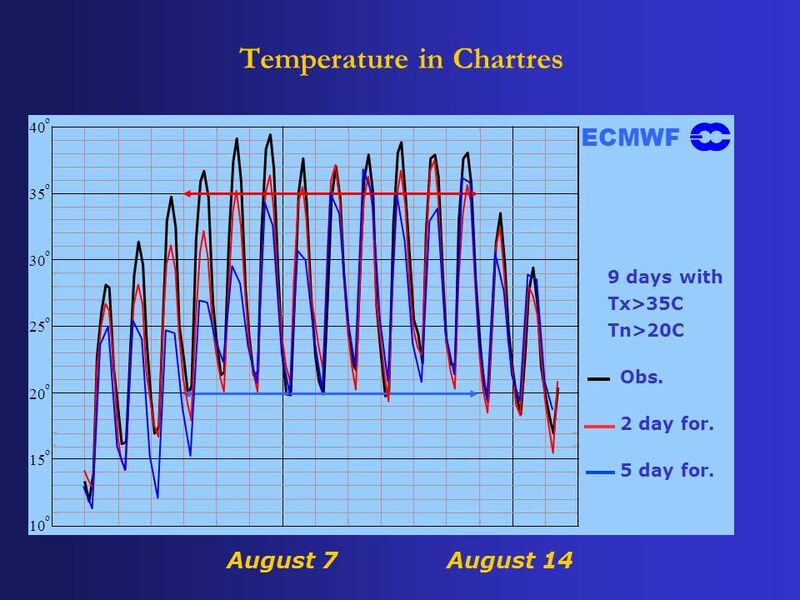 7 For the period running from June 1 st to August 31 st, the year 2003 is the warmest ever recorded in France. 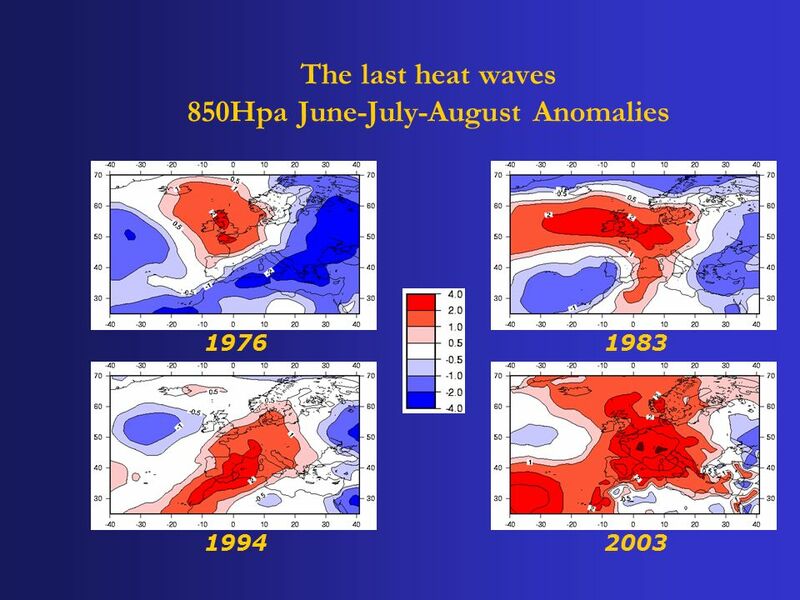 The warming is singular by its amplitude and its extension over Western Europe. 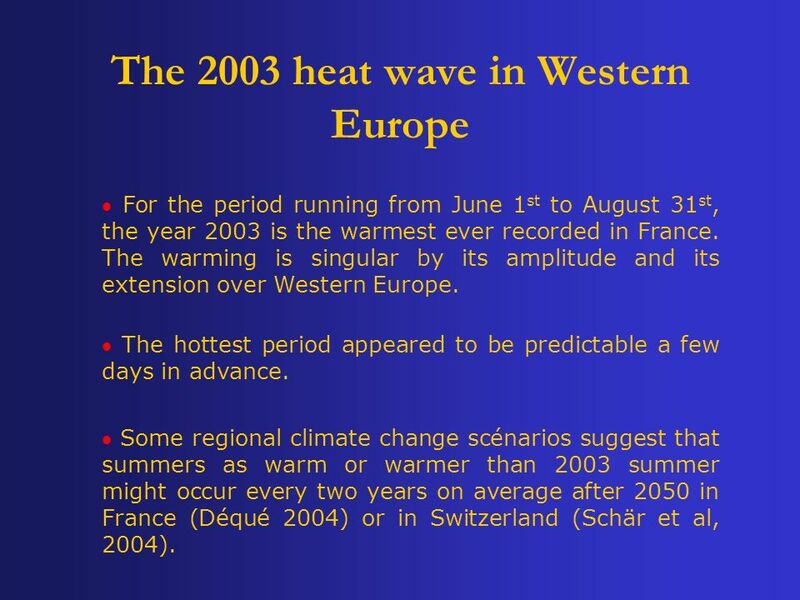 The 2003 heat wave in Western Europe The hottest period appeared to be predictable a few days in advance. 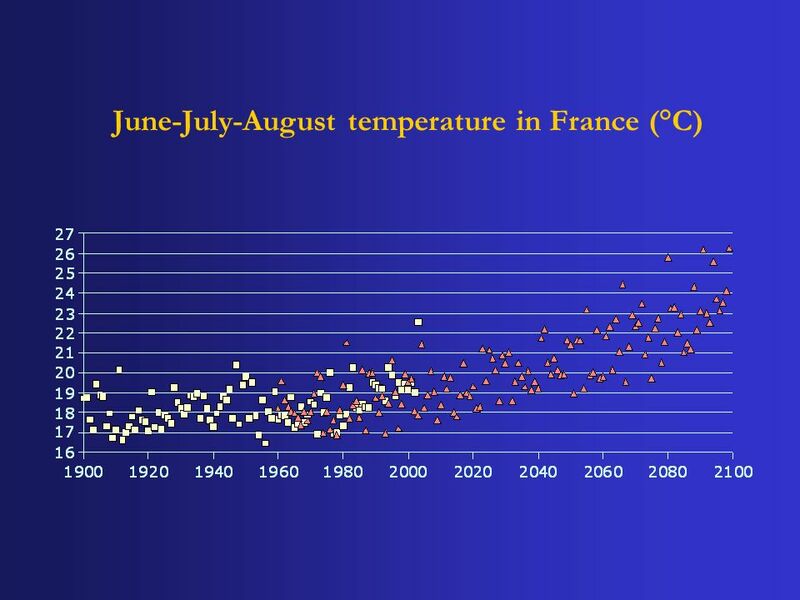 Some regional climate change scénarios suggest that summers as warm or warmer than 2003 summer might occur every two years on average after 2050 in France (Déqué 2004) or in Switzerland (Schär et al, 2004). 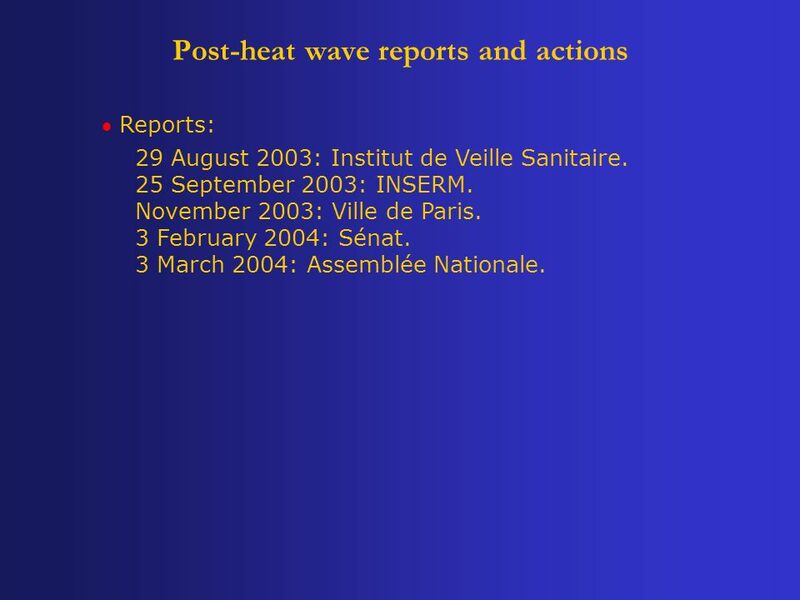 9 Post-heat wave reports and actions Reports: 29 August 2003: Institut de Veille Sanitaire. 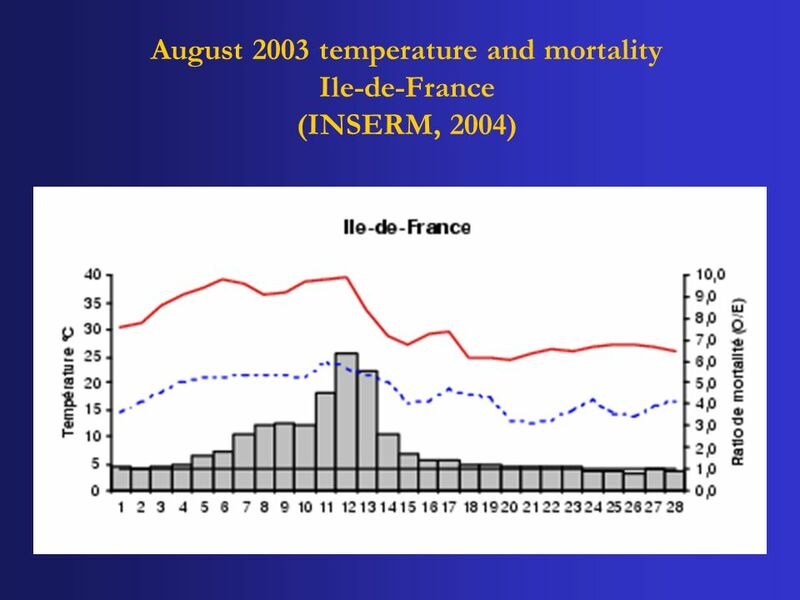 25 September 2003: INSERM. November 2003: Ville de Paris. 3 February 2004: Sénat. 3 March 2004: Assemblée Nationale. 13 The national heat wave plan Level 1: Seasonal survey from 1 June to 30 September to check up the different action plans and to inform the public for prevention. 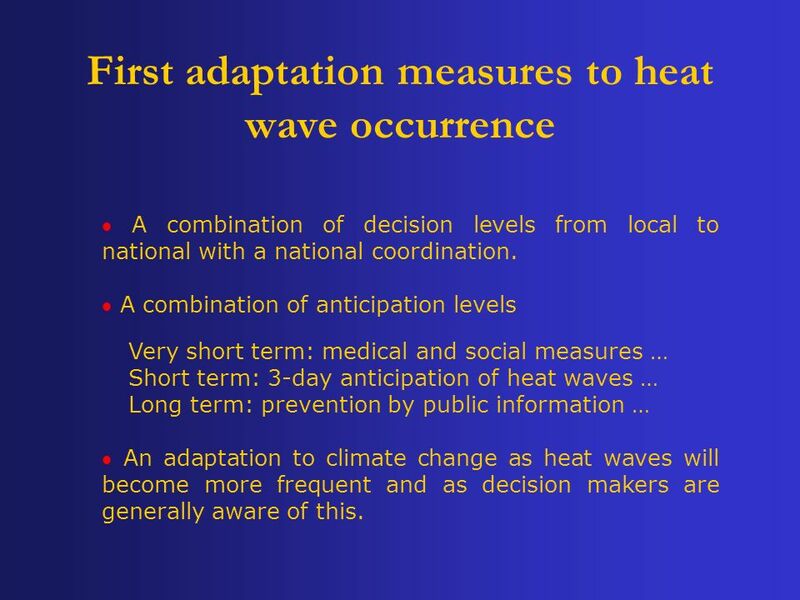 Level 2: To apply medical and social measures when an heatwave is occurring. Level 3: To mobilize public services from local to national scales when an overtaking of biometeorological thresholds is forecasted in the next 3 days. Level 4: To apply exceptional measures when an heatwave is extending and lasting. 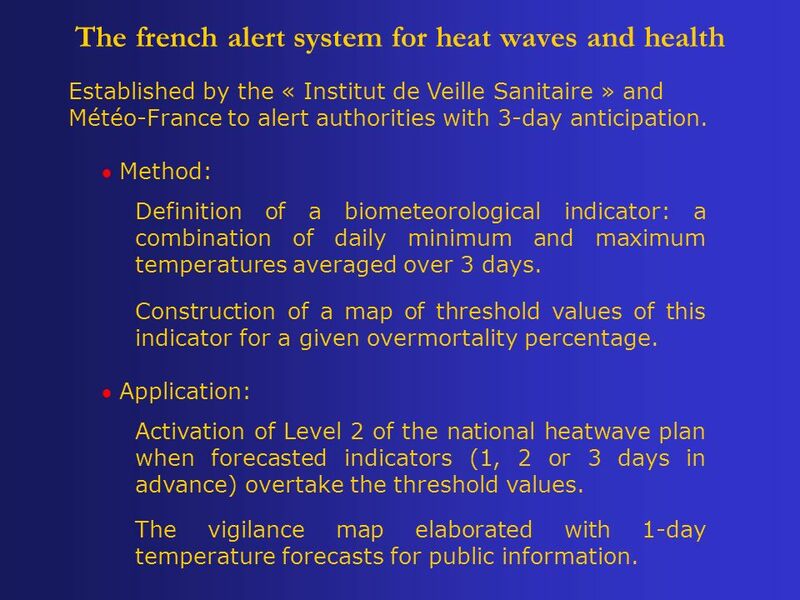 14 The french alert system for heat waves and health Method: Definition of a biometeorological indicator: a combination of daily minimum and maximum temperatures averaged over 3 days. 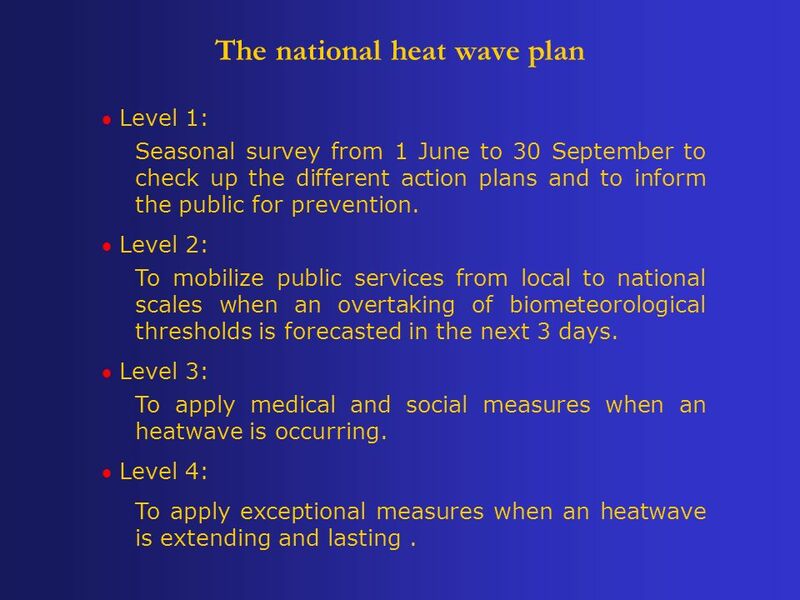 Application: Activation of Level 2 of the national heatwave plan when forecasted indicators (1, 2 or 3 days in advance) overtake the threshold values. 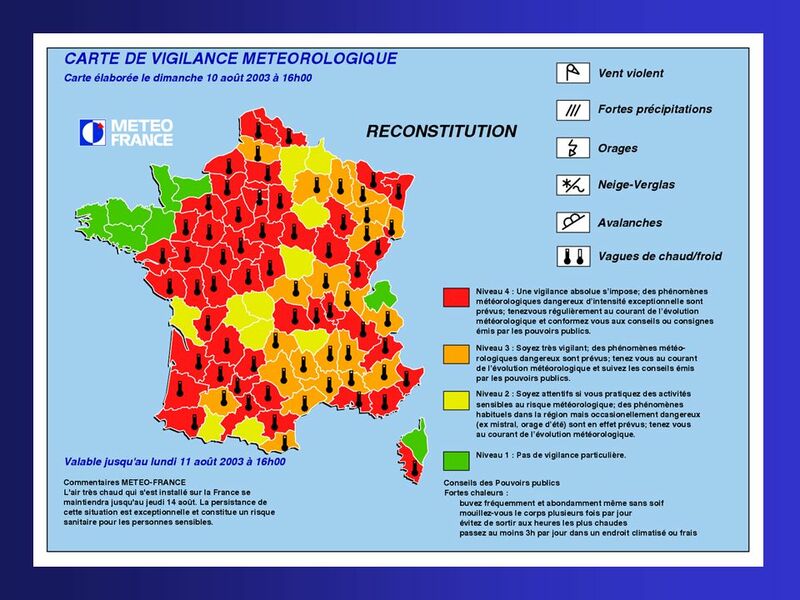 Established by the « Institut de Veille Sanitaire » and Météo-France to alert authorities with 3-day anticipation. Construction of a map of threshold values of this indicator for a given overmortality percentage. The vigilance map elaborated with 1-day temperature forecasts for public information. 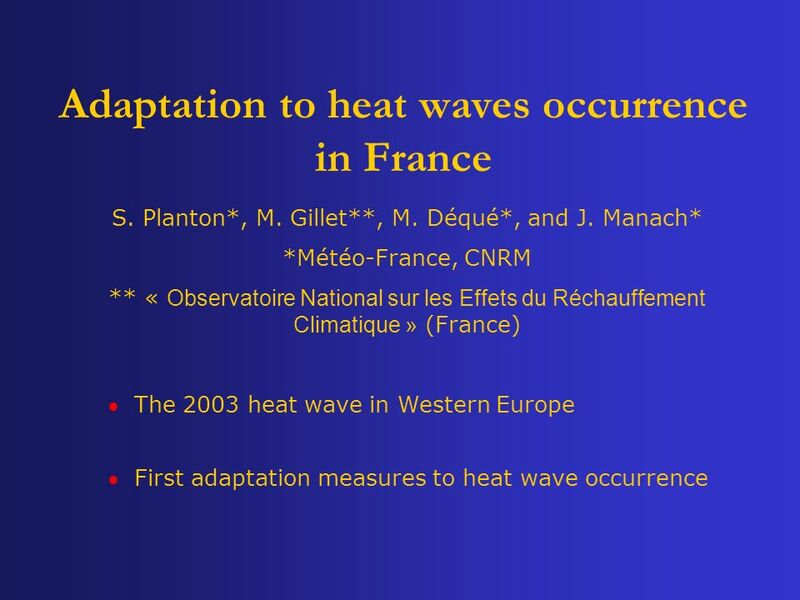 Download ppt "Adaptation to heat waves occurrence in France S. Planton*, M. Gillet**, M. Déqué*, and J. Manach* *Météo-France, CNRM ** « Observatoire National sur les." 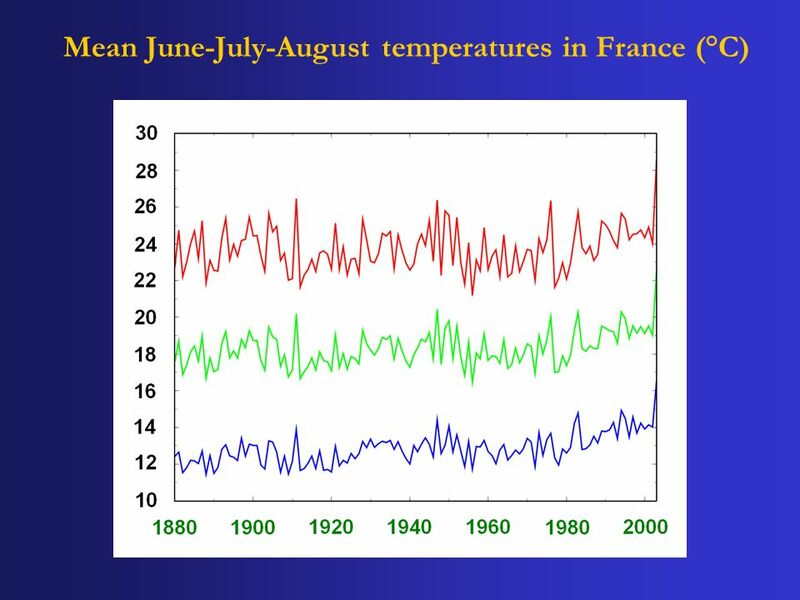 The role of increasing temperature variability in European summer heat waves Christoph Schär, Pier Luigi Vidale, Daniel Lüthi, Christoph Frei, Christian. International Flood Network - IFNet - Akira Sasaki Deputy Director General Water in Rivers / IFNet Secretariat. Dr. Christos Giannakopoulos Dr. Basil Psiloglou Meteorological and pollution factors affecting hospital admissions in Athens, Greece ENSEMBLES WP6.2 Meeting. The French Presidency Of the European Union 1 July December 2008. 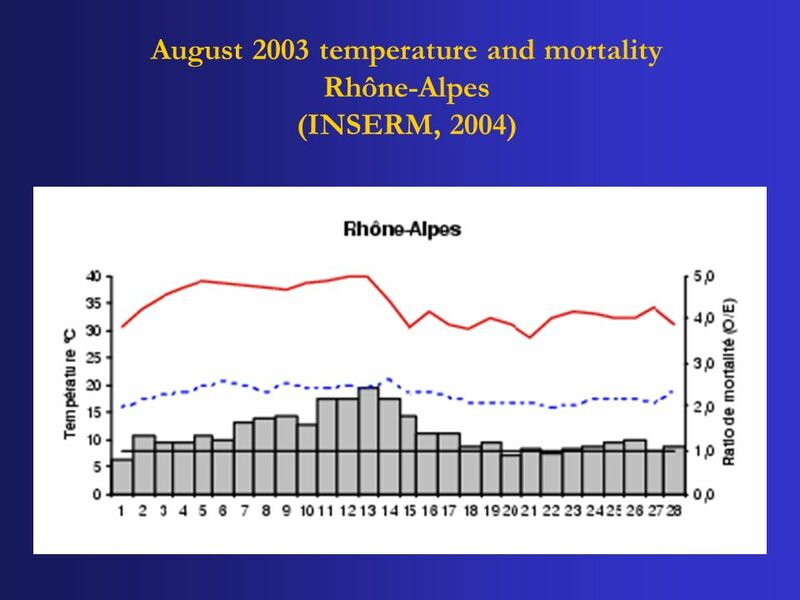 Protecting health in an environment challenged by climate change: European Regional Framework for Action Extreme temperatures Dr Bettina Menne. 1 THE SECOND CHANCE SCHOOL OF MIDI-PYRENEES FRANCE. ECMWF products and the European energy markets ECMWF, Reading, 16 th of June 2005 Stefan Meulemans Sempra Energy Europe Ltd. London. ECMWF Slide 1Met Op training course – Reading, March 2004 Forecast verification: probabilistic aspects Anna Ghelli, ECMWF. 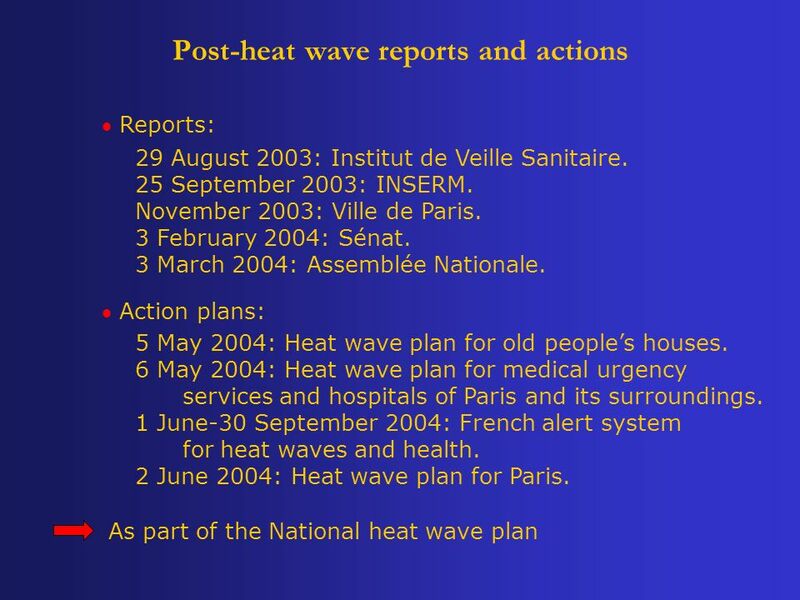 Factors Contributing to the Summer 2003 European Heatwave Emily Black, Mike Blackburn, Giles Harrison, Brian Hoskins and John Methven CGAM and Department. Jet-stream images For BBC programme Five Miles High Mike Blackburn, Brian Hoskins University of Reading August 2007 Colours on the maps show wind speed.